From New Latin bactērium, from Ancient Greek βακτήριον (baktḗrion, “small staff”), from βακτηρία (baktēría). (microbiology) A single celled organism with cell walls but no nucleus or organelles. 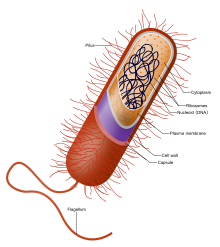 In most formal writing, bacterium is the singular form of the noun, and bacteria the plural form. This is in accord with the word's Latin etymology. However, in ordinary speech, some speakers use bacteria as a singular, with plural either bacteria or bacterias. This is usually considered incorrect. From Ancient Greek βακτήριον (baktḗrion, “small staff”), from βακτηρία (baktēría).